If you are looking for the best frog leg recipes, I have some tasty meal ideas below. 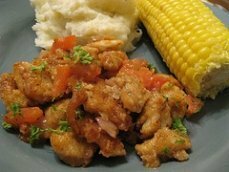 I have more than just recipes for frog legs, you will find delicious and easy fish recipes and seafood recipes below. Frying frog legs is the most common and best way to eat them (in my book). If you have a recipe that "wows" - please send it to me and I will post it with your name. In a large pan, add the lemon juice, salt and bring to a boil. Add frog legs and cook for 3 minutes. Remove and dry well. In a bowl, beat the eggs and add the garlic and onion powder. Add salt and pepper to taste. Place the bread crumbs on a plate. Dip the frog legs in the egg batter and then roll in the bread crumbs. Let sit to dry (more crispy and crumbs stay on better). Now heat the oil to fry in a heavy skillet. When hot, carefully place frogs legs in the oil and fry until golden brown on each side. Drain on paper towels and serve with sliced lemon and hot sauce. Following is another tasty frog leg recipe. In a skillet, add the butter and mushrooms. Season with the garlic and onion powder. Saute for 10 minutes or until tender. Add tomato sauce and parsley; simmer for 10 minutes. Heat the oil in a heavy skillet. Dip the frog legs in cream and then the flour. Place carefully in the hot oil and fry for 10 minutes or until golden brown. Serve with the mushroom sauce.